Spanish painter and architect. He was trained by his father EL Greco, and it is practically impossible to distinguish their painting. Theotokopoulos is documented as a painter in 1603. The single signed work (c. 1595; Madrid, Prado), a copy of El Greco s Disrobing of Christ, shows him as a rather inept follower of his father, although his treatment of figures is much harder and more angular; they are almost caricatures. Of more interest is his altarpiece (1607-09) for the church of La Magdalena, Titulcia, Madrid. In collaboration with his father, in 1603-07 Jorge Manuel executed an extensive programme of pictures for the Hospital de la Caridad in Illescas: a Madonna of Charity, a Coronation of the Virgin, an Annunciation, and a Nativity. The extent of Jorge Manuel s contribution to this commission remains a matter of conjecture to this day, yet the presence of his portrait in the Madonna of Charity would suggest that it was greater than in previous cases. Jorge Manuel did not develop much individual profile as a painter. Yet as an architect, at least in Toledo, he carved out a successful career. After his father s death he ran the workshop and produced paintings that relied entirely on his father s example. In recent years these works have increasingly become the focus of research, and attempts have been made to define the precise extent of the contributions by father and son. His architectural altarpiece (1623) for S Clara la Real, Toledo, was influenced more by Juan Bautista de Monegro than by any architectural work El Greco had designed. 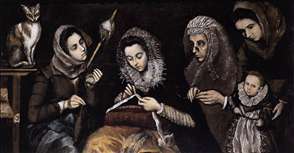 See more details about "The Family of El Greco"